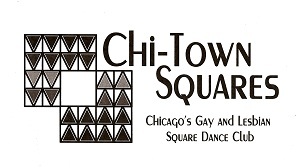 Chi-Town Squares, for its 25 years of breaking barriers between LGBT and non-LGBT square dancers, while teaching and providing a venue for LGBT square dancing in Chicago and the central U.S. It hosted an international gay square dance convention in 2010, and one of its offshoots is the well-known She Devils, a bearded troupe of drag performers who dress in square-dance attire. Chi-Town Squares, Chicago’s gay and lesbian square-dance club, was started in 1987 by Jerry Cohen, a well-known community activist who himself became a posthumous Hall of Fame inductee, and Ron Goldman, a DJ from Carol’s Speakeasy. David Boyer, the bar’s manager, had heard there was a desire to form a square-dance club in Chicago. About 30 students signed up for lessons in response to ads placed in gay newspapers. Classes were held at the Wellington Avenue United Church of Christ, which also was a home to the Good Shepherd Parish Metropolitan Community Church and other LGBT organizations. The first caller was the late Lin Jarvis, who, along with his wife, Barb, helped to gain attention and grow the club. Chi-Town Squares now has more than 125 members and six club callers, two of whom are on staff in any given year. It is a member of several umbrella organizations, including the Metropolitan Chicago Association of Square Dancers, of which it is the only gay member club and the largest of any club in membership. Chi-Town Squares also belongs to the International Association of Square Dance Clubs. Through its affiliation with the Chicago association, Chi-Town Squares has helped to erase barriers between LGBT and non-LGBT square-dance communities. Though some have been reluctant, most other clubs have opened their arms to Chi-Town Squares, attending classes and dances. As a member of the international association, the club proudly hosted an international convention at the Chicago Hilton and Towers from July 1 through 4, 2010, attended by more than a thousand square dancers from all quarters of the world and of all persuasions. Many of the out-of-towners attending were also present to witness that year’s Pride Parade. Chi-Town Squares is a teaching organization, offering instruction in all levels of square-dance steps. Because of its high-level instruction, members of other clubs often attend lessons. One of the six callers on staff travels the world calling square dances in such places as Japan, Germany, Sweden, and Denmark. The club also has fostered associated groups, the best-known of which is the She Devils, a bearded drag troupe in typical square-dance attire. Chi-Town Squares has also helped to develop new clubs in such other cities as St. Louis (Gateway Squares) and Grand Rapids (Grand Squares). Many members also dance with the non-LGBT Recyclers square-dance club in Chicago’s northern suburbs and attend the Chicago association’s semiannual dances. In its 25 years, Chi-Town Squares has provided alternative activities for LGBT persons in addition to bridging a cultural gap between square-dance communities that are often aged 55 and higher.